In Advertising > Pharmacy > Show & Tell. These are two different 1940's era medical applicators from two different suppliers that made items for emergency first-aid kits and also supplied WWII medics field packs. - The first is an Iodine Vial / Applicator made by the Davis Emergency Equipment Company, Inc., Newark, NJ - The stock# is 9111800 and it is a glass vial with a black bakelite screw-on cap. (It still contains it's Iodine) - The vial is packed in a two-piece wood holder, that seperates in the center to open it, with a paper label - about 3" long. 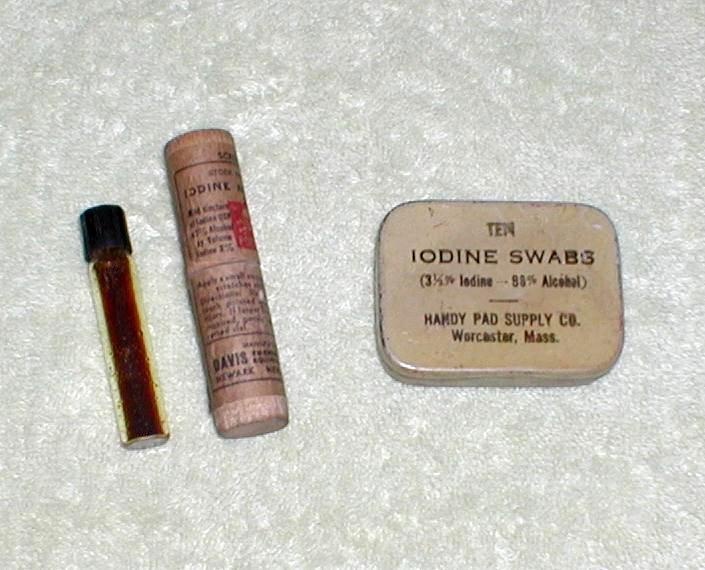 -- The second item is a small tin with a hinged lid that held ten Iodine Swabs (now empty) made by the Handy Pad Supply Company, Worcester, Massachusetts. - The tin measures 2 1/4" by 1 3/4" by 1/2" deep.